Do antidepressants work, or are they glorified dummy pills? How can we tell? 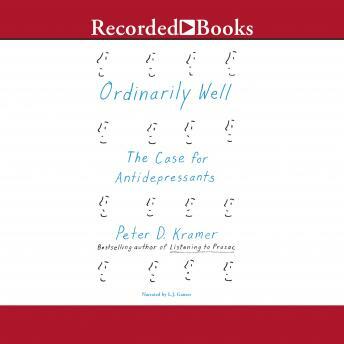 In Ordinarily Well, the celebrated psychiatrist and author Peter D. Kramer examines the growing controversy about the popular medications. A practicing doctor who trained as a psychotherapist and worked with pioneers in psychopharmacology, Kramer combines moving accounts of his patients' dilemmas with an eye-opening history of drug research to cast antidepressants in a new light. Kramer homes in on the moment of clinical decision making: Prescribe or not? What evidence should doctors bring to bear? Using the wide range of reference that readers have come to expect in his books, he traces and critiques the growth of skepticism toward antidepressants. He examines industry-sponsored research, highlighting its shortcomings. He unpacks the "inside baseball" of psychiatrystatisticsand shows how findings can be skewed toward desired conclusions. Kramer never loses sight of patients. He writes with empathy about his clinical encounters over decades as he weighed treatments, analyzed trial results, and observed medications' influence on his patients' symptoms, behavior, careers, families, and quality of life. He updates his prior writing about the nature of depression as a destructive illness and the effect of antidepressants on traits like low self-worth. Crucially, he shows how antidepressants act in practice: less often as miracle cures than as useful, and welcome, tools for helping troubled people achieve an underrated goalbecoming ordinarily well.